The Westside Regional Trail contributes to a regional trail network that provides recreational activities, commuter routes and access to 84 different THPRD sites. THPRD has a strong, well-connected central spine that provides access to 81 different outdoor sites and three indoor facilities. Use of powerline corridors has helped the district provide lengthy stretches of multi‐use trails for recreation and bicycle commuting. The maintenance, improvement and continued expansion of this regional trails network is at the center of the district's Comprehensive Plan, serving as one of the district's eight umbrella goals. Goal 5: Develop and maintain a core system of regional trails, complemented by an interconnected system of community and neighborhood trails, to provide a variety of recreational opportunities such as walking, biking, and jogging. Three regional trails provide the backbone of this growing network; a fourth serves a similar function while not technically meeting the definition of a regional trail. Extending north to south, the Westside Trail one of the region’s most important corridors, connecting neighborhoods and communities while providing access to the region’s distinctive rivers, forests and prairies. Within THPRD boundaries, Westside Trail expansion has been a priority. 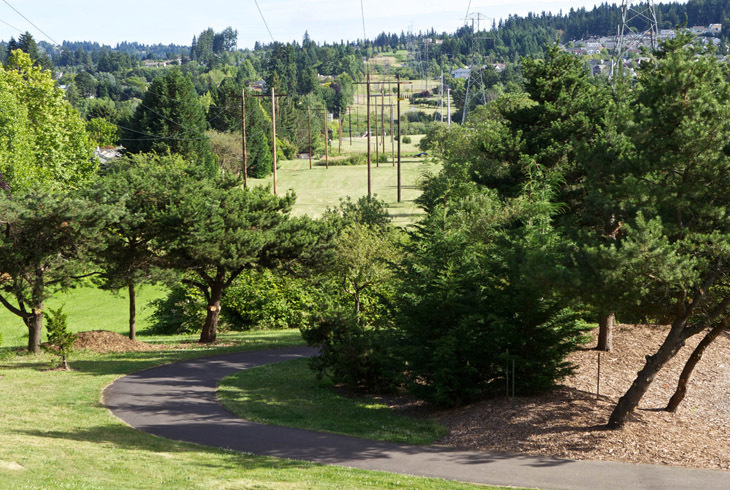 The 2008 bond measure earmarked more than $4 million, resulting in three new trail segments, including a paved 1.5-mile expansion over Beaverton’s Mt. Williams. The Rock Creek Regional Trail consists of 3.5 miles of ADA-accessible trail in the northenmost part of THPRD. The trail runs west to east along Springville Creek and a powerline corridor from Rock Creek Blvd. toward the Washington/Multnomah County line. It passes through forests, wetlands, meadows, and a variety of parks, making it a great destination for walking, running, biking, recreation, and wildlife viewing. It also connects to Hillsboro's Rock Creek Trail. The Fanno Creek Regional Trail is one of THPRD’s most used trail systems, serving people interested in active recreation, nature exploring, or using the trail as a transportation corridor. Within THPRD boundaries, the Fanno Creek Trail includes 4.5 miles of ADA-accessible trail that meanders through the Garden Home-Whitford and Raleigh Hills communities. The trail begins at the Garden Home Recreation Center (you can park and access the trail on the north side of the grassy lawn) and largely follows Fanno Creek west toward 217,through Greenway Park, dipping south to SW Scholls Ferry Road and into Tigard. While not defined as a regional trail, the Waterhouse Trail is a four-mile, ADA-accessible trail that begins just north of Tualatin Hills Nature Park, and extends north across Highway 26 toward PCC Rock Creek along the powerline cooridor. THPRD's Howard M. Terpenning Recreation Complex is easily accessible from the trail, which also passes through wetlands, meadows, and a variety of sports fields. In 2016, a planned segment connecting the Waterhouse Trail to the Westside Trail will yield a 10-mile, nearly continuous trail from the south boundary of the district to the north boundary.